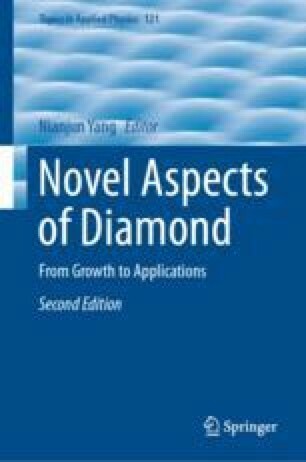 The purpose with the present studies has been to support and explain the experimental observations made regarding the effect by N-, P-, S- and B-doping on the diamond (111), (100)−2 × 1 and (110) growth rate, respectively. All surfaces were assumed to be H-terminated. Density functional theory calculations were used, based on a plane wave approach under periodic boundary conditions. It was shown that the surface H abstraction reaction is most probably the rate-limiting step during diamond growth. Moreover, the results showed that it is N, substitutionally positioned within the upper diamond surface, that will cause the growth rate improvement, and not nitrogen chemisorbed onto the growing surface in the form of either NH (or NH2). These results coupled very strongly to experimental counterparts. For the situation with P doping, there were no visible energy barrier obtained for the approaching H radical to any of the diamond surface planes. Hence, the growth rate must be appreciably increased as a function of doping with P. It was furthermore observed that S and B doping will lead to anomalous changes in the diamond growth rate (i.e., either increase or decrease), depending on the position of these two dopants in the lattice. These phenomena are also strongly supported by experimental observations where there are both increasing and decreasing effects of the diamond growth rate by S and B doping. This work was supported by the Faculty of Uppsala University, and the Swedish Research Council (VR). The computational results were obtained using CASTEP from BIOVIA.